Here in Germany where I am in the moment the weather calls for something warm, however in Australia I hear the tropical weather has hit big time. A sweet valentine cookie recipe will interest more the Europeans, but I also have some recipe ideas for romantic valentines dinners. You know the ones that satisfy you but don't stuff, make you feel special, but don't give you gas? If you'd like a recipe for any of the dishes below email me and I'll send you my version: galasorganickitchen@gmail.com I look forward to reading from you! My Valentines menu suggestion with photos for inspiration and wetting tastebuds. What about making some Bath Pralines from my December post? NOW TO THE RECIPE: Red Heart Cookies with Rosewater Lemon and Cardamon! You can't really see the cookies, but what a nice photo?! You are looking for a romantic delightful and healthy cookie recipe for your loved one/s? This one is for you, you can even make them just for yourself. Crunchy, a little sweet and exotically infused, these light pink heart shaped cookies are a good old fashioned looking but new age tasting creation. I wish you delicious moments. To make the beetroot juice grate the beetroot on a fine grater and squeeze the juice out with your hands, squeezing like you mean it. Use the left over beetroot for a salad mixed with lemon, sultanas and mint. Mix your dry and wet ingredients in separate bowls. Now knead them both into a nice non-sticking non-crumbling delicious dough. If you need to add more flour, do. If you’ve added too much flour add more rice syrup or coconut oil. Doughs can be tricky, but in other words you’re not lost if you muck up a little, you can always adjust. Roll onto a floured surface, roll out to cut your heart cookie shapes. Bake at 170C for 15 minutes- ish until they smell great and look slightly browned underneath, depends how you like cookies over or under done, or just right, you can do it! When they cool they firm exponentially. Enjoy. Tip: If you don’t have rosewater just leave it out and add 1 tbsp of lemon juice or water instead. For an extra red effect you’ll unfortunately have to add a few drops of red food colouring, beetroot always looses it’s pink colour when baked. Try adding 1/3 cup chopped dates and 1/3 cup walnuts chopped instead of the rosewater, cardamon and lemon, this will be a sweet chewy nutty cookie. Gluten Free Vegan Corn Bread. Boom. I've recently posted a photo of my Zucchini Corn Bread on social media. You asked for the recipe on Facebook and Instagram which was too large to squeeze into just one comment, so I'm sharing the recipe with you here. I hope you make it really soon and shoot me a line about how it went for you: galasorganickitchen@gmail.com I'd love to hear from you. I have an immense weakness for really delicious gluten full bread with real butter, but I can eat a whole lot of this corn bread satisfying me very much. My month without bread and sugar continues. When you want a gluten-free bread for savoury snacking with hidden veggies, this corn bread is your choice, very nice with soups, stews, topped with avocado, tomato, sprouts and a drizzle of lemon, or enjoy purely naked. Instead of the oregano you could add your own wild foraged herbs, such as nettle, dandelion, yarrow. Actually, I think it’s a bit fancy and fantastic making my own corn bread, I hope you do too! Makes a small to medium sized (20cm by 20cm) baking tray, or 2 bread baking tins filled only a little. When you fill them too high the bread will crumble. Preheat your oven to 180 C and line your baking tray. Mix the milk with the vinegar and let sit for about 15 minutes. Mix the flaxmeal with the water and let sit for about 15 minutes. Mix the dry ingredients in a bowl. Add the oil to the vinegar milk mixture. Prepare your other vegetable bits. Combine wet ingredients in a bowl and pour into the dry mix. Then add the rest of the vegetables and mix well. Mix everything lovingly and pour into the baking dish lined with baking paper, sprinkle salt, pepper or herbs and a few olives on top. Bake for 35-45 minutes or until it browns slightly and a knife inserted in the middle comes out relatively clean. Best to cool the bread before cutting to avoid crumbling, but do go wild, how can one resist warm vegan corn bread?! You have to get the extra quick cooking polenta, the finest in town. Polenta that needs more than 5-10 minutes to cook will make this bread crumbly. Cut thicker slices to avoid crumbling. The freshness of your flours will determine the overall flavour of the bread. Please feel free to leave out the chilli if that’s not your thing. Instead of parsley and green chilli try different herb combinations such as rosemary & salt, sage & chilli, thyme, lemon rind & pepper, what else will you come up with? Merry what? More and more gifts to collect, where is the merry, where is the gratefulness for what you already have, for what you can create with your own two hands? For being able to move your body, digest, breathe, shout, hug and laugh? Those things are not to be taken for granted. I never expected that I would be in Germany again for another winter, this time without mum, as she passed away in September. I decided life was rather mysterious and surprising, mostly not in the way I want it to be. I sway from being utterly angry, to seeing the good in all, to lethargic existence, to explosive awakening passion and calmly wondering what's up next. I was at the One Dance Tribe dance event in Europe this June and whilst dancing I caught myself planning my mums funeral. I thought that's ridiculous, she's still alive and straight away organised a garden party to celebrate her life. May you realise how blessed you are to love someone, anyone in your life and show it to them now, because you never know how long they, or you, will be around. Through my mums passing I have decided that sharing healthier recipes with you all is very important, but also very importantly that you have fun making them while enjoying your precious life. Getting out into nature, getting some oxygen in your brain, getting your blood flowing, using your creativity, caring for your community, expressing your emotions! There are so many things we can do for our overall health and wellbeing. At my mums death bed I saw what was not so important and what was. Going with the flow of good vibrations is certainly a great key for directing your gondola. So, I feel it's about time I share a couple of recipes with you that might help with Christmas craziness in an inexpensive and joyful way. My vegan, sugar and gluten-free cookbook is definitely on the top of my new to do list. If you like you can contact me to test recipes, I would be so happy to hear from you. From Insta post: Hold your horses #gluten free #sugarfree germans let me introduce you to a brand new, new-age #schokolebkuchen #oblaten #vegancookierecipe! Or in english #chocolategingerbread wafercookie. Sounds better in german and touches on traditional baking roots, perhaps producing melancholy feelings. Heat your magic oven to 170C. Dry mix: 1/2 cup #almondmeal, 1/2 cup #buckwheatflour, 1/4 cup cacao, 1tbsp #lebkuchengewürz or #gingerbreadspice, 2 #oranges zest only, 1/2 tsp bicarb, 1 pinch salt -mix well. Wet mix: 1/4 cup #groundlinseeds mixed with 1/4 cup warm water let sit 15 minutes then add 1/2 cup #ricesirup or even better 1/4 cup rice syrup with 1/4 cup maple syrup, 1/4 cup #coconutoil. 2) Bath Pralines finally something for your skin not just your mouth! These bubbling beauties are theoretically edible, but I would rather plunge them in my bath tub or foot soak, for a northern hemisphere warming winter moment. What a sweet Christmas present, right?! I used just one praline for one bath and my skin was so very smooth from the coconut oil. A great way to use up dried roses that you just can't let go off, in this case from my mums funeral celebration. Mix the dry ingredients well, followed by the wet ones. Press into ice moulds, heart shapes are nice, and leave to dry, the oil to cool and harden. Pack, or use. Marvellous. Tip: You can add a few drops of food colouring, beetroot juice doesn't work so well as they won't fizz properly. You can sprinkle the moulds with a few crushed rose petals before filling. Try different layers with different colours. Have fun and enjoy your bubbling smooth fragrant bath experience. Vegan gluten free AND delicious cookie recipes for you! It's that time of the year when no matter what the weather one has to bake at least one cookie for Christmas. I say why not if you are feeling it. Here are two of my favourite cookie recipes. Oh and remember to breathe! I am on a mission to eradicate all sugars and grains from my life, at least for 2 weeks. I’ve been a very gluttonous human in the last few years and it’s now time to clean up my bowels, my skin, my energy, my bum and mojo! I hope sharing this with you all might be just a little entertaining. Having said that my life is anything but ‘perfect’ and I mess it up a lot of the time, for example I have indulged in a whole lot of cake right before this no sugar mission and more precisely I was supposed to start today but I still ate the last piece of cake for breakfast. So, there you have it today’s post for you is my delicious Zucchini Chocolate Cake with Avocado Chocolate Icing! Yum. Yum. Yum. Wish me better luck tomorrow. 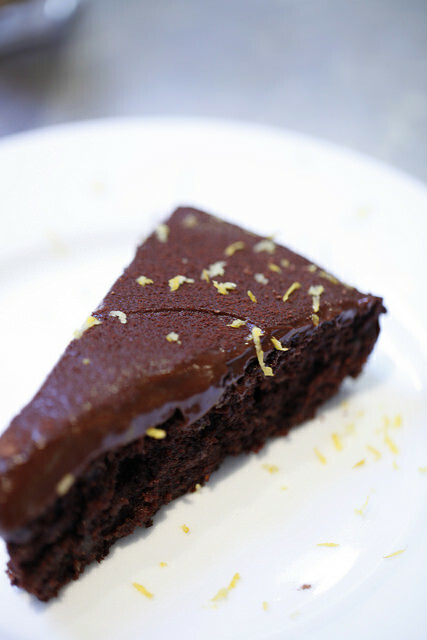 A chocolate cake with hidden zucchini, nut free, vegan, gluten free, refined sugar free?! Here it is. Moist, nutritious, finger licking delicious. If you make these for your kids lunch boxes and can’t use nuts, just use gluten-free flour instead of almond meal. How easy is that? The photo uses melted chocolate for icing. 2 tablespoons ground flax seeds + 6 tablespoons water/ ½ cup- Also works without this addition, but adding this ‘vegan egg’ makes it fluffier and holds better. Mix the ground flaxseeds with the water, stir and let sit for about 15minutes or more.. Mix your wet ingredients. Mix your dry ingredients in a different bowl. Bring the two together. Add the zucchini and chic chips if using and bake for 45min, or until a knife inserted in the middle comes out clean. Let cool a little, then serve. If you want to serve this with the icing you’ll have to make the icing 4 hours or more in advance for it to firm and you’ll have to let the cake cool completely before spreading on the icing. If you are impatient you can also serve the cake warm with the icing poured over it. Both are divine. Blend everything until very smooth and taste test. Taste test. Did I mention taste test? This chocolate icing needs to taste like chocolate, so make sure you added enough cacao and sweetened it with enough coconut syrup. I can’t give exact amounts as the volume of the avocados vary. When you keep it in the fridge it will firm up and you can spread it on the cake like magic. Sprinkle with cacao powder by shaking cacao through a sieve to create a smooth elegant cacao snow covered cake. Let me know how you go and enjoy! Note: Recent inspirations for this kind of view on sugars have been: Grain Brain by David Perlmutter, Sweet Poison by David Gillespie and Sarah Wilson’s I Quit Sugar. Steaming Carrot Coconut Cashew Cake from bring-joy blog spot. Good morning #steaming gugelhupf! #carrotcake. Zucchini Chocolate Cake with Avocado Chocolate Icing. There it is again the #zucchinichocolatecake to yummy looking not to share.